Anthony Skelton has been named a Graham and Gale Wright Distinguished Scholar for 2019-20. This Faculty-wide award recognizes the prominent contributions of internationally-recognized researchers in their fields. Anthony joins an impressive list of philosophers who have previously received this prestigious award: Wayne Myrvold, 2017; Corey Dyck, 2015; Carolyn McLeod, 2011; Robert DiSalle, 2009; Lorne Falkenstein, 2008; and John Bell, 2006. Professor Carolyn McLeod’s Time to Attach (timetoattach.com) research team has been awarded $15,000 from the Conference Board of Canada to complete a report on inequality in, and the inadequacy of, the Canadian government’s current parental benefits system. William Vanderburgh's book, David Hume on Miracles, Evidence, and Probability, will be published by Lexington Books (an imprint of Rowman & Littlefield) in mid-April 2019. David Hume’s argument against believing in miracles has attracted nearly continuous attention from philosophers and theologians since it was first published in 1748. Hume’s many commentators, however, both pro and con, have often misunderstood key aspects of Hume’s account of evidential probability and as a result have misrepresented Hume’s argument and conclusions regarding miracles in fundamental ways. This book argues that Hume’s account of probability descends from a long and laudable tradition that goes back to ancient Roman and medieval law. That account is entirely and deliberately non-mathematical. As a result, any analysis of Hume’s argument in terms of the mathematical theory of probability is doomed to failure. Recovering the knowledge of this ancient tradition of probable reasoning leads us to a correct interpretation of Hume’s argument against miracles, enables a more accurate understanding of many other episodes in the history of science and of philosophy, and maybe also useful in contemporary attempts to weigh evidence in epistemically complex situations where confirmation theory and mathematical probability theory have proven to be less helpful than we would have hoped. Western’s Minorities and Philosophy (MAP) chapter hosted it’s second annual Philosophy Undergraduate Conference on March 15th, 2019. It celebrated the excellent philosophical work of undergraduate students at Western, with particular focus on under-represented areas of philosophy, including (but not limited to) philosophy of gender, race, sexual orientation, class, etc. 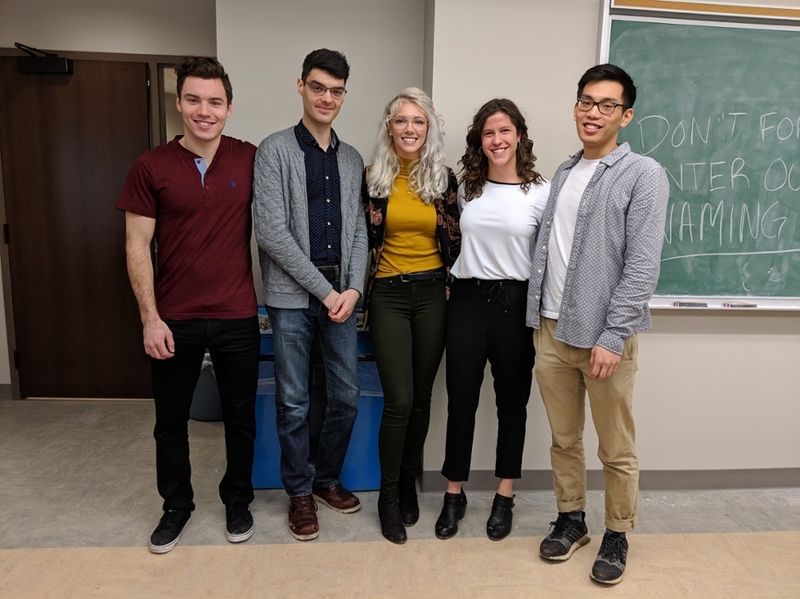 All six speakers delivered outstanding presentations and showcased their unique philosophical ideas to Western’s philosophy community. Topics included LGBTQ+ sexuality and epistemic injustice, ethics and organ donation, economic inequality, gender, multiculturalism, and oppression in the context of legal and criminal justice systems. Each presentation was followed by an engaging Q&A session which continued philosophical conversations surrounding the authors’ ideas. We are already looking forward to next year’s conference! Brad completed his PhD at Western in 1997 under the supervision of John Nicholas. Brad's dissertation was on social epistemology. Kathleen Okruhlik and Bruce Freed were readers, and Alison Wylie was a departmental examiner. Cheryl Misak, from Toronto, was the external examiner. If you are interested in learning more about Brad’s work, feel free to email him at kbwray@css.au.dk. Charles Weijer has been appointed to the editorial board of the Journal of Medical Ethics. In 2016, JME was recently ranked number 1 in the “Top 50 Bioethics Journals” by Georgetown University. For more information see https://jme.bmj.com/pages/editorial-board/. Right now, both biological and adoptive parents are granted a parental leave of up to 35 weeks. However, biological mothers are granted an additional 15 weeks of maternity leave. Read the full story. “There are unique challenges that come with adoption, and there are unique challenges that come with biological parenting too, and we think the 15-week maternity leave responds to that,” said Philosophy and Women’s Studies & Feminist Research professor Carolyn McLeod. “The problem is there isn’t a similar leave for parents who provided permanent homes for children in care. The team’s main partner is Adopt4Life: Ontario’s Adoptive Parents Association, of which McLeod is chair. McLeod said the ‘attachment leave’ would offer adoptive parents caregivers and children more time to address the unique needs of adoptive families. Read the full story. Michael Anderson, Philosophy, Tier 1 Canada Research Chair in Philosophy of Science (SSHRC): His research explores new conceptual systems for psychology and provides a deeper understanding of how the brain works. His work emphasizes an integrated, interdisciplinary approach to the cognitive sciences in helping researchers understand complex systems like the brain. Anderson comes to Western from Franklin & Marshall College in Lancaster, PA. Read the full story here. Western’s MAP Chapter is pleased to announce that our second Philosophy Undergraduate Conference will be held on MARCH 15th, 2019. This conference celebrates the excellent philosophical work of undergraduate students at Western. Reflecting the commitments of MAP, the theme of the conference will broadly focus on any of the following areas: philosophy of gender, race, sexual orientation, class, disability, etc. These themes can intersect with other areas of philosophy. Although papers should be philosophical, authors who apply need not be specializing, majoring, or minoring in philosophy. Presentations will be no more than 15 minutes in length, followed by a short Q & A period. Students are encouraged to submit a relevant term paper from a previous class, roughly 1500-2000 words or 15 minutes read aloud. Papers will be reviewed anonymously and selected by faculty based on relevance to the theme of this conference. The selected authors will be notified by email. Faculty and graduate student organizers will be available to help authors of accepted papers prepare for the conference. Please submit papers to Western’s MAP email address: mapwestern@gmail.com by JANUARY 31st, 2019. If you have any questions about this conference, please send an email to Western’s MAP email address (mapwestern@gmail.com). AB: Can you talk a bit about your philosophical background and research interests? WM: I’m a philosopher of science, with particular interest in philosophy of physics. My route into philosophy was one that, I believe, is a common one for philosophers of science. I started out, as an undergraduate, in a science major (physics), became intrigued by philosophical questions arising from the science, and made a move into philosophy for my PhD. Much of my work has been on the foundations of quantum mechanics, but more recently I’ve been thinking a lot about the use of probability in physics, and, in particular about its role in statistical mechanics. Early this summer I completed a draft of a book manuscript on the topic, which I hope will be published in the none-too-distant future. It’s called Beyond Chance and Credence. AB: I understand that you participated in several conferences and events this summer; can you say more about them? WM: For me, the value of going to conferences is that it gives me an opportunity to talk to people face-to-face about matters of mutual interest, to meet new people and re-establish connections with people I’ve known for a long time, and to be exposed to work that might otherwise escape my attention. This year I was involved in four events. The first was New Directions in Foundations of Physics, an annual conference that brings together philosophers and physicists to discuss topic in foundations of physics. Participants are encouraged to float new ideas, so it’s a terrific opportunity to be exposed to work that I might otherwise be unaware of. This year it was in a lovely location: Viterbo, in Italy. This year’s conference was special for me because it included a session in honour of our sorely missed long-time colleague, Bill Demopoulos, who passed away last year. This included talks by a member of our department, Robert DiSalle, and by one of my former graduate students, Michael Cuffaro. That was in early June. Later in June there was a workshop I organized, called Thermodynamics as a Resource Theory, bringing together physicists and philosophers to discuss what I regard as an exciting recent shift in direction in work on thermodynamics. You can see videos of the talks on YouTube. The other events were in July. I attended, and gave a talk at, Foundations 2018, in Utrecht, and was participating faculty at a summer school in Split, Croatia, with the title The Chimera of Entropy. The Foundations conference was this year’s instantiation of a longstanding series of interdisciplinary conferences in the UK and Europe. These are huge events, involving philosophers and physicists at all stages of their careers. AB: Which event did you find most interesting/rewarding? WM: Well, going to Italy involves eating Italian pizza, and there’s little that’s more rewarding than that. Though, I must say, since Split is on the Adriatic coast, and attracts a lot of Italian tourists, they do pizza pretty well, there, too. Professionally, I’d have to say that it’s a toss-up between the workshop I organized, and the Split summer school on entropy. It’s always great to meet and interact with graduate students and other up-and-coming researchers from other institutions, and I’m pleased to say that, at the summer school, many of them took full advantage of the opportunity to ask questions in between sessions. One of the things that the organizers did right was to schedule a day in the middle in which there were no talks, and participants had an option to join on an excursion to Trogir, just up the coast. That meant that we were all on a boat for several hours, talking to each other. Lots of good conversations. AB: What value do you think these sorts of summer schools have for students and faculty members? WM: One thing that’s very important, for students, is that they get exposed to different approaches to the subject. We all do our best to steer our students towards what is most important. There’s a danger that students will become too enmeshed in a particular approach, and not realize that the presuppositions of that approach are not universally shared. It’s also valuable to have discussion face-to-face, as things that people take for granted, and don’t explicitly say in their published work, can come out. For me, it’s valuable, as I get to meet at an early stage of their career people who are on the way to becoming the leading researchers of tomorrow. AB: Will any of the issues discussed in Croatia make their way into your teaching or research? WM: Absolutely. As soon as I got back I made some adjustments to the draft of the book I mentioned earlier, in light of the discussions at the summer school. In particular, I added a section because of a question and follow-up discussion with one student, which made me realize that there was need of an explanation of a point brought out in the discussion that isn’t clearly made in any of the existing literature, as far as I know. This will affect how I teach the topic next time I do a seminar on it. And I’ll be doing a grad course on philosophy of quantum mechanics in the Winter term, and some of the things I learned at Utrecht conference will find its way into that. Congratulations to Nicole Nowoselski, winner of the 2017-18 Chair's Annual Essay Prize for her essay "The Unbecoming of the Self? An Existential Analysis of Identity and Dementia". The paper was written for Professor Helen Fielding's course PHIL 3555G: Continental Philosophy. Find out more information about the New Directions in Philosophy of Cosmology and visit the John Templeton Foundation. Nearly six years ago, it started as a personal blog on which philosophers Tracy Isaacs and Samantha Brennan would share their fitness journeys, publicly tackling a challenge to be in the best shape of their lives by the age of 50. Readership grew quickly, and the blog, Fit is a Feminist Issue, soon became an online community, with more than 200 individual contributors sharing their personal challenges, experiences and feminist views of fitness. This month, Isaacs, Associate Dean (Academic) in the Faculty of Arts & Humanities and Philosophy professor at Western, and Brennan, a former Philosophy professor at Western (now the Dean of Arts at the University of Guelph) released a new book, Fit at Mid-Life: A Feminist Fitness Journey. Read the full story here. Western selected 15 Faculty Scholars to recognize their significant achievements in teaching or research. The recipients are considered all-around scholars and will hold the title of Faculty Scholar for two years and receive $7,000 each year for scholarly activities. Read more. Andrew Botterell couldn’t ignore the email. When a note from Academics Without Borders (AWB) popped up in his inbox, requesting curriculum support for Bahir Dar University’s law school in Ethiopia, it might as well have addressed him directly. 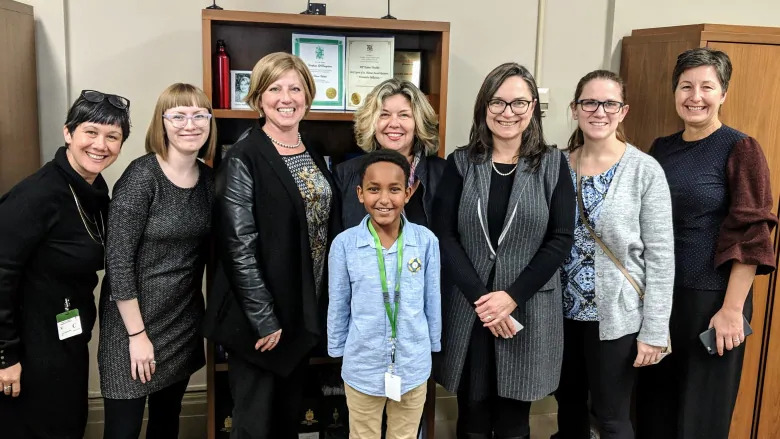 Botterell, who is the Chair of Western’s Department of Philosophy, and holds a joint appointment with the Faculty of Law, has adopted two children from Ethiopia. With a connection to the country and the skills to answer Bahir Dar’s need, he saw an opportunity to give back. It just happened to be during a time of political tension in the country. “The proposal (from AWB) was to have someone visit their law school and teach a course on advanced jurisprudence, or the philosophy of law. Bahir Dar wants to create a new PhD program in law but, to do that, they need people who can supervise PhD students,” Botterell explained. “As I was getting ready to travel in February, the Ethiopian Prime Minister (Hailemariam Desalegn) resigned. The Minister of Defence declared a state of emergency in the country. There had been a lot of protests against the government, and while this was the first voluntary handing over of power in Ethiopia, the understanding is he was going to get pushed out, anyway,” he continued. Read the full story here.